The Archer Daniels Midland Company Biorenewables Education Laboratories (1114 & 1115 BRL) are located on the first floor of the BRL house equipment and instrumentation that can be used to enhance diverse educational activities. The majority of the equipment and instrumentation purchases were funded through generous support from Cargill. The lab spaces are fee-for use. Use our Request for Lab Space to request a reservation of either or both lab spaces. Lab requesters are responsible for providing materials and safety (PPE) equipment for their lab activities. The fee-for-use costs are billed to an account provided by the requester one week prior to lab activities. Several lab activities have also been developed and are available as “off-the-shelf” from the website for requesters to utilize. Both participant and facilitator resources are provided in the areas of : biomass properties, biodiesel production, bioplastics production, fermentation, distillation, and thermochemical. Prior to utilizing any lab equipment, it is recommended that both facilitator and participants view the Video Standard Operating Procedure (V-SOP) Overviews. These are intended to supplement the written SOPs. Lab safety is a priority, and requesters are responsible for compliance with lab safety procedures. The Request Lab Space form outlines these requirements, as well as maximum participants allowed in the lab spaces. Requesters are responsible for providing participants with the required safety (PPE) equipment prior to the commencement of lab activities. 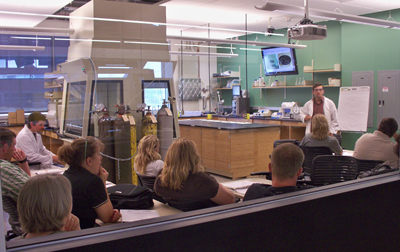 It is of utmost importance that lab participants have a safe and enjoyable educational lab experience. This lab space hosts: two chemical hoods, BioFlow 310 fermenter with ancillary equipment, NAVAS thermogravimetric analyzer, furnace, E24 incubator/shaker, and several distillation units. This lab space hosts: Wabash 15-ton compression molder for bioplastics, Viscosity tester, 430 GC/FID, hammer mill, grain/biomass hopper testing unit and BioBus’ 55-gallon biodiesel processor. Located just off the east side of the high-bay area the biomass prep room hosts: 3 sieve shakers and knife mill.